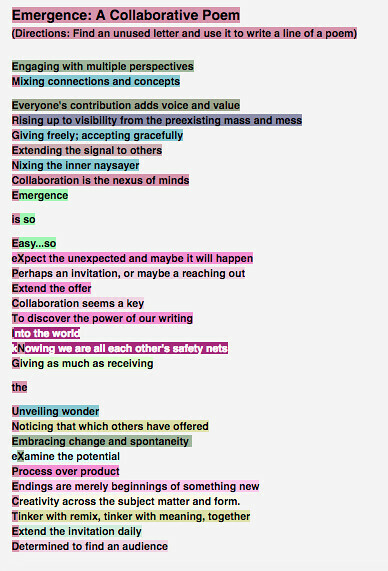 One of my participatory ideas from my presentation last week on “Emergence: Expecting the Unexpected” for the 4T Virtual Conference on Digital Writing was to invite those in the presentation to write an acrostic poem with me. Over the course of a few days, I invited others, too, and the result is pretty nifty. I used an open source writing space called Board.Net (built off elements of the old Etherpad), and used the timelapse element to capture the poem being written. PS — Terry Elliott is also using Board as an invitation to play with a poem. This entry was posted in Making Learning Connected MOOC, Poetry, Technology Resources. Bookmark the permalink.